INGER JOHANNE GRYTTING is interviewed in KUNSTKRITIKK for her Solo Museum Show at The VIgeland Museum in Oslo. 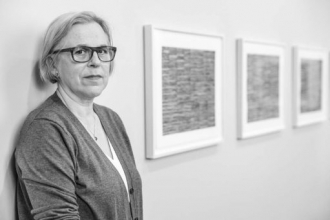 The main feature of Inger Johanne Grytting's drawings is the horizontal, repetitive line. With a Faber Castell 8B pencil she draws parallel lines, creating a dense surface often shaped as columns. Each work starts in the upper left corner, goes downward and continues again in the next column. When the tip of the pencil breaks, continuity is disrupted, and a white "hole" appears. Before each new drawing, she defines a set of self-chosen rules, which help to create resistance in the performance. Each line carries the weight of the body when the pencil moves over the paper. She has described it as a chisel’s repetitive cuts in a three-dimensional matter. The lines are not abstract, they communicate at low frequencies. They carry meaning in a sublime way. Inger Johanne Grytting was born in 1949 in Svolvær and has roots in Tromsø. In 1972, she moved to New York, where she still lives and works.